This battle is part of what’s considered one of the bloodiest city fight ever – the 102 day siege of Budapest between December 1944 to February 1945. Soviet & Romanian troops laid seige to Budapest in their drive towards Berlin. Hitler declared the city “Festung Budapest” (“Fortress Budapest”) and so it was to be defended to the last man by German and Hungarian troops. This battle was particularly vicious in that its inhabitants were never evacuated and their suffering continued long after the city’s surrender on February 13 1945. Scenario “RPT1 Ferenc Jozef Barracks” took place on Jan 12 1945 at the Ferenc József Barracks which is located between Kerepesi Road, Hungária Boulevard and Pongrác Road. I tried to locate the area on Google Map. To those of you who are more adept in the subject: I’ll be very appreciative if you will correct me on the matter. Romanian 9th Cavalry enter the board from the north-eastern side (botton right) of the map. Their goal is to clear the barracks (marked with a “V”) on the south-western side (upper left) of the map of any good order Hungarian units within five turns. Considering the 2 mins turns in Advanced Squad Leader, this exchange allows the Romanians 10 mins to meet their objectives. Each hex in Advanced Squad Leader represents about 40 meters. The Romanians need to go about 10 hexes (400 meters) straight up the street from middle of the map up towards the left just to get into a position where the they can attack the barracks. That’s 2 turns of out of 5. Considering the first turn is for entry and for trying not to get killed over open ground (off-board is open ground), the Romanians has only two turns left for fighting. This will have to be a maneuver war. The Hungarian 1st Tanks Division start the scenario concealed in concrete buildings. Somewhere among the open windows there is a heavy machine gun pointing at the open ground below. In real life the battle was so savage that all the officers and the NCOs of the attacking Romanian companies were killed but they did capture the barracks. This is my first ASL game with an opponent (“PBeM” – Play by Email). I am really appreciative of the tutorage of my good friend Don “Zovs” Lazov. Zovs’s a terrific teacher who’s bringing the ASL rules to life for me. As you can see, he opts for a forward defense. This allows him to take out some of the Romanians right at the start. As I am on a tight schedule, Zovs doesn’t have to kill me, he only need to delay my advance while he backs off into the barracks itself. How do I beat this defense and clear the barracks in 5 turns? How do I even engage the Hungarians without getting mauled over the open ground? 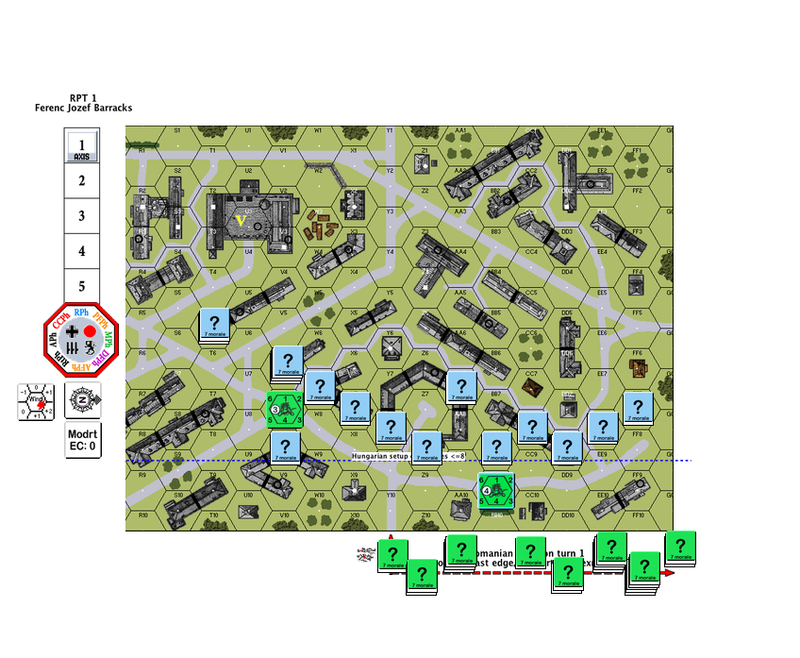 This entry was posted in Game Play and tagged AAR, Advanced Squad Leader, ASL, ASL Scenarios, ASLRB, board wargame, Budapest, history, Hungary, Romanians, Siege of Budapest, wargames, Wargaming, World War II. Bookmark the permalink. Don’t split your forces, try and concentrate on one area (possibly leaving small numbers to keep the defenders ‘honest’). Use smoke to screen your advance across open areas and try and retain concealment (or gain it) wherever possible. Hope it goes well for you. Thanks Joss, that’s great advice! Will let you know how it went this week when I get around to writing this up. Like the ASL vets say, ASL is all about tradeoffs. Against the need for protection there’s the fact that the scenario only allows 5 rounds in which the Romanians pretty much need to tear up the street to even get to the barracks on time! !